The patent venue statute for corporations made sense when most corporations were still small local concerns. But, today, most companies that are likely to be sued for patent infringement are national, and due process would not be offended by having them sued anywhere they are actually doing business. The original patent venue statute was enacted because of “abuses.” But what abuses? Have the times changed enough so that those abuses, whatever they were, are no longer relevant? I think the court should look at these factors as well, if they have not considered them before. BTW, does anyone actually know what the abuses were? I think, probably, that Bilski, Alice, IPRs, and the like has made the E.D. Tex handwringing less necessary. When I was a SA we had a guy with a midlevel type online retail business get a demand letter for a Amazon-1-click type patent, and he settled because it was obviously cheaper to do that than litigate even if you won on an early summary judgement, particularly if venue was outside of IL. I haven’t seen something like that since. So it was either already an unlikely scenario, or it has been curbed. I’d venture there are a few true cases of Etsy people getting sued cross country that everyone piggybacks off of to justify their own agenda. It also doesn’t help that ED Texas seems (from an outsider’s perspective) like a Kangaroo court, similar to Cook County juries in civil cases in IL. Alex, anyone who refused to settle for less than the cost to litigate for even a few months is a fool. That being said, you do understand that the cost of litigation game is a two-edged sword? If a patent owner is willing to settle for the cost of litigation, he is somewhat taking advantage of the system — and we should be interested in fixing this somehow such as by providing special courts for small(er) claims. But the Eastern District of Texas exists, not as a kangaroo court, but as a court that does not abide by the games that law firms play to drive up the bills and because corporations do not like to settle until they punish the patent owner as much as possible in order to force a lower settlement — because patent owner who go to court are asking for a lot more than litigation avoidance settlements. Getting to trial quickly as the last thing they want because if they lose, they have may have to fork over what the patent owner has demanded or more, and face the possibility of an injunction. For sure. Just saying that there are probably a few similar fact patterns where the patentholder demanded more, and there was actual litigation that created the mystique of being dragged into Texas. Like I said, it probably is a few cases of legitimate gripes that people piggyback all their complaints off of. You call Eastern Texas, “a court that does not abide by the games that law firms play to drive up the bills.” You’ve obviously never litigated there. It costs far more to litigate in E.D. Texas as a defendant than anywhere else in the country; law firms love it. For many years, you couldn’t even contest discovery scope; the court’s standing order required the defendant to turn over everything that was “relevant” without even awaiting a request. It was heaven for big law firms, and even today, with aggressive amendments to the Federal Rules, it’s still much harder to contest broad discovery in E.D. Tex. than any other district. And we all know discovery obligations are asymmetrical in most patent cases; the defendant has an 18-wheel truck full of documents, and an NPE plaintiff (which is 95% of the cases filed there) usually has little more than a copy of the file history and maybe a manilla folder with a few sheets of paper. I’ve seen many cases where big defense law firms do not want to transfer out of E.D. Texas because they will make so much more money defending their clients there, than after a transfer to another district. Well, “that may be relevant” is a problem. But that was in the rules. As to costing more than elsewhere, I doubt it if the whole case is considered. The problem in Texas is the expenditure is compacted into a smaller time space. It just seems like it costs more when it does not. Is anyone really taking this seriously? I thought that it was all a bunch of fabricated buzz from the cheerleaders at Law 360, trying to make some news. The Federal Circuit did not “remove” the “special rule” in 1400(b) pertaining to patent infringement. It held that corporate residence is the same under 1400(b) as it is in 1391(c), which was amended to substitute personal jurisdiction for business license. Non-corporate parties are not subject to the same provision. Moreover, the article suggests a mere shift forum shopping from Texas to Delaware (where incorporation for tax purposes should be irrelevant to actually doing business or acts of infringement). 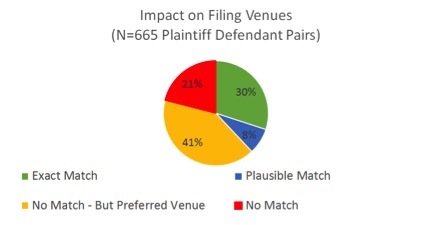 While other venues may be affected as well, the article suggests that they are limited in number and that there would not be an even distribution of plaintiff filings or a closer relationship between defendants and the plaintiffs’ chosen forum. If the present venue jurisprudence is unfair or flawed beyond the rest of civil jurisprudence, the Federal Circuit cannot fix it. Congress will have to act, and balance the interests of all parties, not just corporate defendants. Steve – as we note in the post, we used ReferenceUSA to simulate the 1400(b) doing business requirement – so your assumption that we somehow missed multistate companies isn’t satisfied. It’s possible, of course, that Reference USA missed some, but we are relatively confident – there were plenty of non-huge defendants that got sued. And you are right that there would be a shift to Delaware – but not entirely to Delaware. Not as many defendants are incorporated in Delaware as we thought going in. I think saying a bunch of “retailer” cases will be filed out there anyway is misleading. Venue may technically pass muster under 1400(b) in that situation if a local retailer is named, but there’s almost no way the CAFC wouldn’t reverse a denial of a discretionary transfer under 1404(a) in that situation. So the truth is that the number of suits in that district would, after a few years, drop down to a tiny trickle. Those cases are nothing more than “customer suits,” and likely to be transferred to the district where the underlying supplier company is headquartered. Plaintiffs haven’t been successful in keeping suits in E.D. Tex. by simply naming Wal-Mart as a defendant. As the noose ever tightens. What is so bizarre to me is that there all these people that “just know” that innovation would be better off without patents when–in reality–they have no real-world experience. Is that just a general comment showing displeasure with the state of the world? It doesn’t seem to have anything to do with this post. This study wasn’t about innovation or getting rid of patents. Plus, I was a partner at a law firm and represented startups and huge public companies both as plaintiffs and as defendants – how is that not real-world experience? What is obvious is that this is part of the effort to limit the influence of the ED of Texas which has been –in some respects–a great help against the judicial activist tide to end patents. I know that Colleen Chien puts out a constant stream of anti-patent papers and articles in the popular press that are filled supposed facts that I do not believe represent the real world. I know your old law firm. I’ve litigated on the other side of your law firm, though not you to my knowledge. In the real world of innovation, patents play a key role for many reasons. Patents are integrated into large companies and how they do innovation. Patents are an integral part of start-ups. Patents are an integral part of employment arrangements with technology companies. Without patents, we will end up with draconian employment agreements which is what the new trade secret bill is all about. The fact is that anyone that has worked in this field next to the innovation knows the great role that patents play. If I thought that the law schools would take action against the law professors for ethical violations, I would make it my hobby to file ethical complaints against people like Lemley and Chien. But after investigating this possibility, it was clear that the law schools don’t care what the professors do. Ironic a guy is getting slagged for being anti-patent who wrote a paper titled “Everything is Patentable”. I didn’t “slag [Michael] for being anti-patent”. That is not true. I said this paper was part of the movement to limit the influence of the E.D. of Texas. I did slag Chien and Lemley both of whom I think are very anti-patent and both of whom are judicial activist. The fact is that something odd happened in that the E.D. of Texas has fought back against the SCOTUS. It is a good thing. The SCOTUS and Fed. Cir. have been legislating at the bench. Insurrection is the right response and the E.D. of Texas has provided a little bit of this. For example, they have held a number of patents not invalid under Alice. Yea! This has resulted in the anti-patent movement (Lemley, e.g.) taking aim at the E.D. of Texas. That is the big picture–reality. And Chien certainly does not agree with my views if her recent article in the Washington Post is any indication of her views. I would kind of like to fix this problem before lessening the influence of the E.D. of Texas. Remind them of the obstetric forceps invented by the Chamberlens family. Nearly a hundred years they kept it secret, as they feared it would ruin them if anyone else could duplicate their feats. Untold deaths caused by the default to secrecy. When the incentive for patents are gone, trade secrets will be the rule. It’s not clear exactly what this panel is going to write but I didn’t detect a whole lotta love for the defendant’s arguments. Moore, in particular, was fairly vocal in expressing her dubiousness. I thought the attorneys for both sides made excellent presentations, however. If this study had been published earlier, I wouldn’t have been surprised to hear it mentioned as the parties did discuss the pros/cons of concentrating patent litigation in particular venues. Jurisdiction and statutory interpretation nerds will enjoy listening. This panel is never going to overrule VE on their own…. none of these justices are the legal scholar type famous for writing cutting edge decisions. Moore pretty much told him the case was weak, unless a larger panel thinks very strongly otherwise this is going nowhere. So we will likely have another S Ct case for next year. 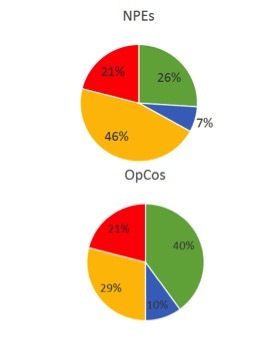 A table is nearly always better than a dumb pie chart; the only worse design than a pie chart is several of them, for then the viewer is asked to compare quantities located in spatial disarray both within and between charts […] Given their low density and failure to order numbers along a visual dimension, pie charts should never be used. Humans are much better at comparing linear differences (e.g. the height of a column) and numbers than they are at comparing angles and areas. This is a great point. The pie is probably least objectionable when there are just two or three classes being compared, one of the classes overwhelmingly dominates, and the differences between the small classes are irrelevant. Damn, I’m about to publish a paper that is filled with pie charts. Indeed, there are pie charts within pie charts. But when I tried to present the same data via a table, people’s eyes glazed over. I agree here that maybe side by side bars might work as a visualization if not a table.